Great health starts with your next bite! 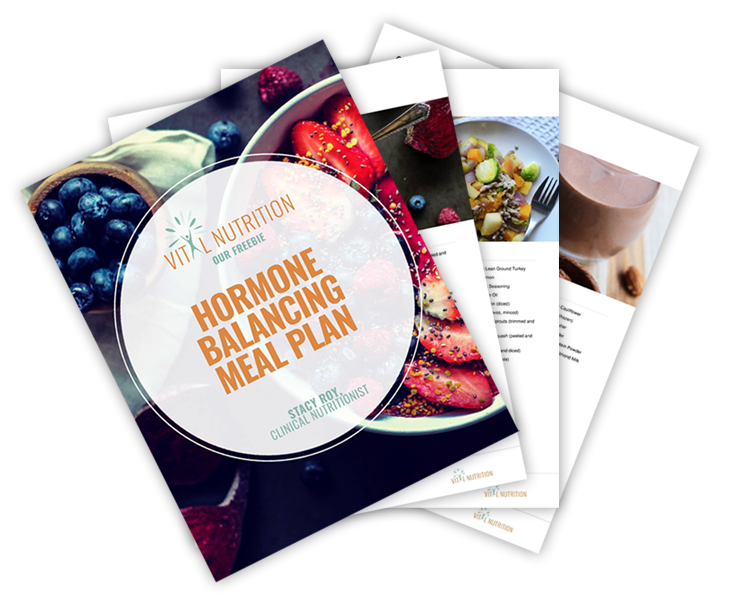 Sign up to receive my Hormone Balancing Meal Plan which will get you on the right track to optimum health with a week of recipes and grocery lists! As a bonus, you will also be signed up for my newsletter which includes recipes, nutrition tips, and information on how you can feel and look your best. Hi, I’m Stacy Roy, a nutrition consultant. I am a Clinical Nutritionist, Board Certified in Holistic Nutrition®, and Women’s Health Educator. I started Vital Nutrition Services as a way to combine my life-long love of food and nutrition with my passion for enhancing people’s health through nutritional changes. Ever since I was a kid, I have always loved cooking, eating, experimenting with food, grocery shopping, and making my food from scratch. After graduating from San Francisco State University with a Bachelor of Science in Health Education/Women’s Health, I earned my credentials as a Certified Nutrition Educator from Bauman College. I then had the privilege of working at the Shanti Project, one of San Francisco’s oldest caregiving nonprofits for people with cancer and HIV/AIDS. It was during my seven years at Shanti, I discovered my passion for supporting people in making important and, sometimes, life-saving health enhancements through nutrition. Nutrition is vitally important for everyone, especially for people with compromised immune systems. In anticipation of starting my own nutrition counseling practice, I left Shanti to earn my Masters in Clinical Nutrition from the University of Bridgeport. I am a member of the National Association of Nutrition Professionals and became Board Certified in Holistic Nutrition® in 2015. Additionally, I am a Certified Autoimmune Protocol (AIP) Coach and Hair Mineral Analysis Practitioner. I have extensive training in working with individuals who follow Ketogenic, Autoimmune Protocol (AIP), Weston A. Price Foundation (WAPF), Gut & Psychology Syndrome (GAPS), Specific Carbohydrate Diet (SCD), Paleo, and Primal diets. In total, I have been providing tailored nutrition counseling, nutrition seminars, and food preparation classes for fifteen years. Over that time, my treatment style has evolved, allowing me to effectively work with many types of health conditions. I specialize in Digestive Wellness, Autoimmune Diseases, Hormone Balancing, Preconception Nutrition, Fertility, Endometriosis, PCOS, Fibroids, and Immune Enhancement. I spend as much of my spare time as possible with my wonderful husband, our sweet daughter, and incredibly spoiled cat and dog. We enjoy family picnics, the dog park, and long relaxing hikes.